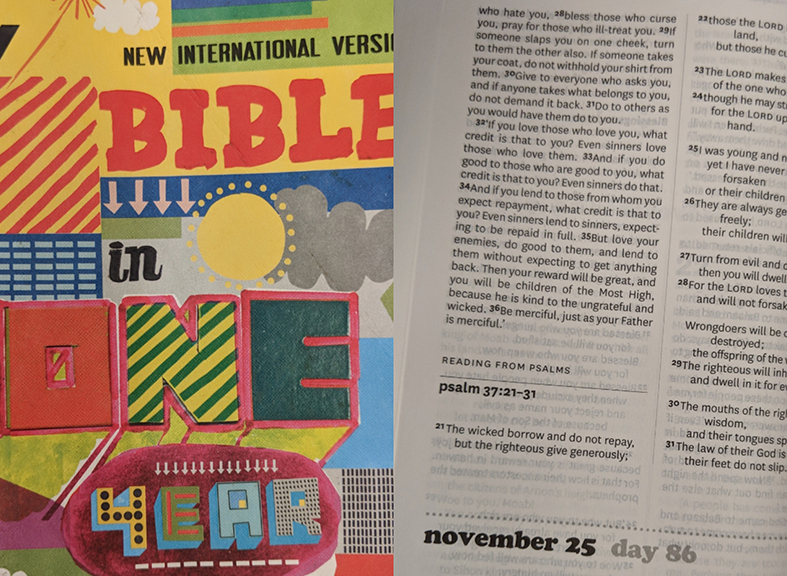 As the church celebrates Bible Sunday (October 28), it’s had me thinking about how we can make sure the Bible is accessible to people of all ages and all levels of understanding. 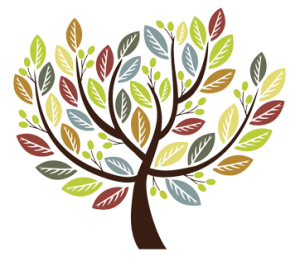 There have been a number of confirmations of young people around the diocese in recent weeks, which is also a good prompt to think about whether their ongoing discipleship includes access to a book that they can really understand. Gone are the days when every family could be guaranteed to have a bible with pride of place on their bookshelf. Many families don’t own a bible and are much less likely to have a copy written in way that is easy for them to build up a picture of the God inside. But the good news is that there are plenty of options out there that even people who aren’t keen readers will be able to immerse themselves in. If a family have had a child baptised, they are likely to have a children’s bible of some sort. One with bright, colourful pictures, and easy to read, stripped back stories. 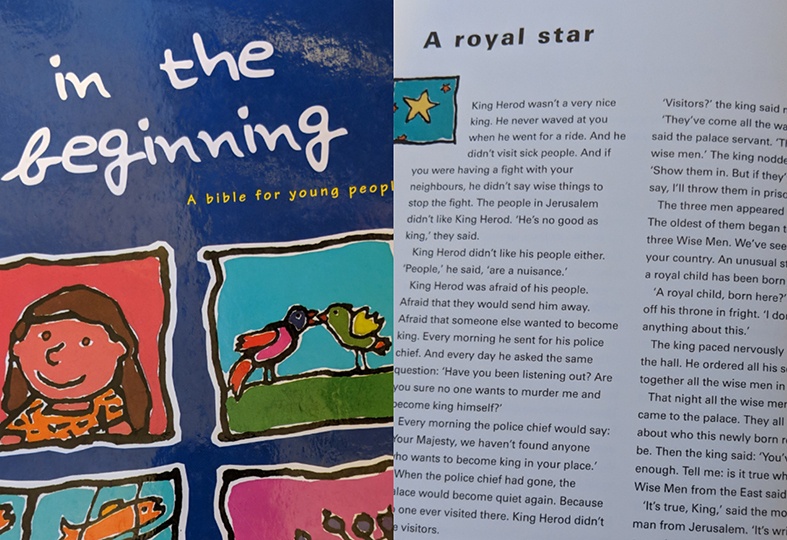 There are plenty of good children’s bibles around, and they can be found in any Christian bookshop, and many high street stores. You can either go for the full bible, or narrow it down to the New Testament, or dive into books of stories like Jonah, David, or Noah. The stories are fantastic at catching a child’s imagination and will become ones that they want to come back to. However, as children get older and the other books they read start to include less pictures and more words, the temptation is to go straight for a teenage bible, which can often be too big of a jump, no matter how exciting the cover. There are other options in between though, even for children who don’t read much in their spare time. 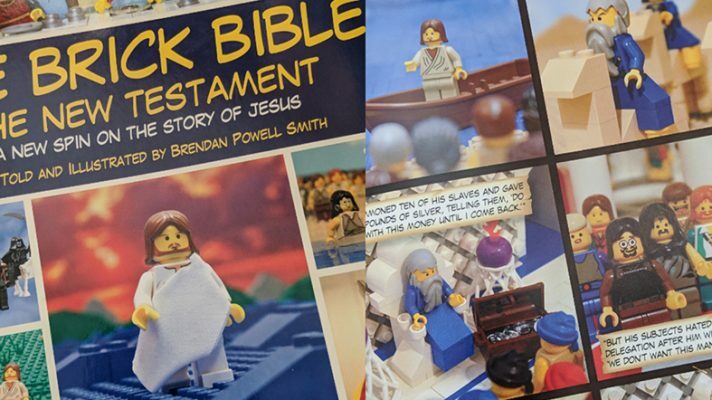 For children who enjoy playing with Lego you can choose The Brick Bible, which is a comic book style telling of the bible stories, recreating in Lego. 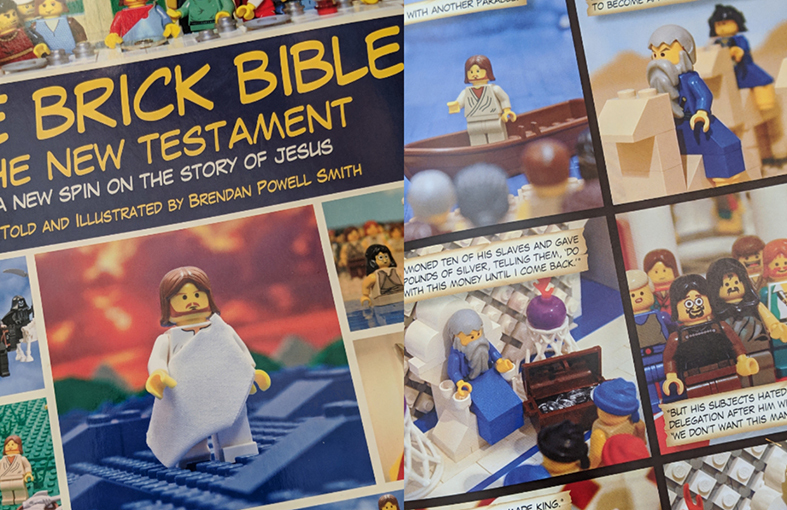 The Brick Bible still tackles some of the gorier stories in the Old Testament, however, seeing them in Lego format takes the edge off a bit! As well as making the Bible easy to read, the Lego landscapes also inspire children to go away and recreate the stories themselves, giving an opportunity for further exploration. 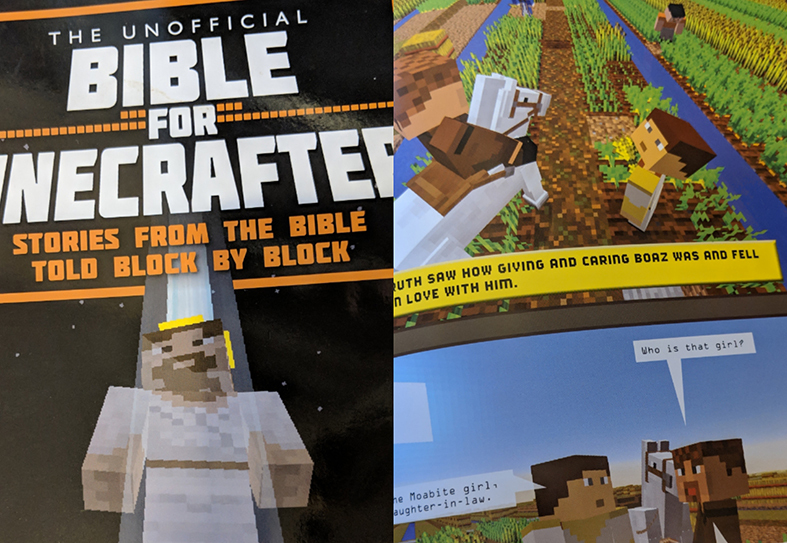 Although eclipsed somewhat by Fortnite in recent months, many children are still hooked on the online gaming world of Minecraft and, not surprisingly, a Minecraft version of the Bible is also in circulation, simply called the Bible for Minecrafters. It follows a similar layout to the Brick Bible but with the characters made out of Minecraft bricks, and put into landscapes that you would expect to find in the game. In some ways it is even easier for children to go and recreate stories, as they are not limited by the physical bricks they would need for Lego. With both books, the novelty factor is likely to draw children in, and the hope is that they then become engrossed in the stories. If Minecraft or Lego aren’t a particular draw, but the child enjoys comic books, then the Action Bible is another alternative. 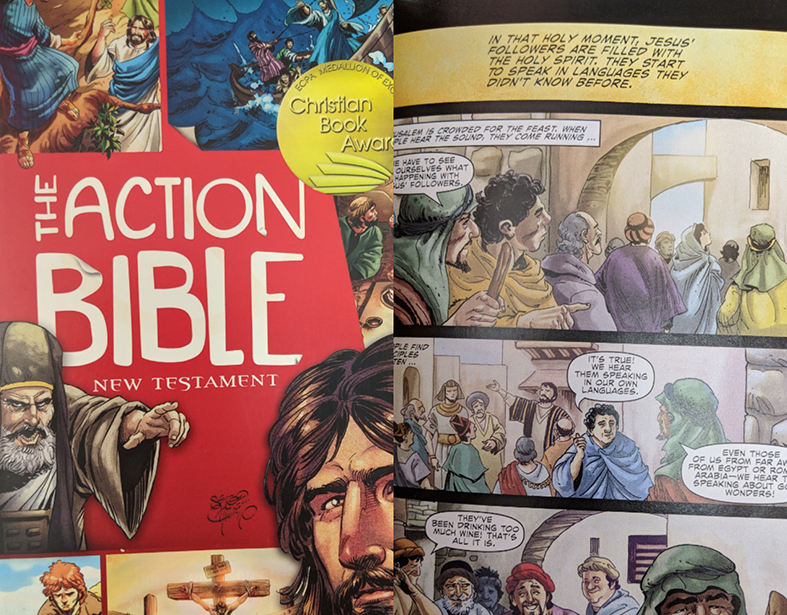 Told in comic book format again, but with more realistic illustrations, the Action Bible is more suited for slightly older children. There is a bit more text throughout, although still primarily through speech bubbles, but the stories are not quite as stripped back and include some of the details to help children understand more clearly what is going on behind the scenes. For more able readers or older teens – or adults who are still new to the faith – there are still a few options. There are some middle-ground versions of the Bible that will include lots of pictures and the Bible stories still written as stories, or the next step is the full text of the bible in a translation that is easier to understand than the King James Version- however poetic it may be! The Message bible is probably written in the most easily accessible language, as it contemporises the situations and includes more modern idioms so that people have more of a picture of what it would have felt like hearing the words of Jesus, or the situations of the Bible stories first hand, in a way that makes sense to them. Jesus was a storyteller who told stories about situations his hearers would be familiar with, so the Message tries not just to rephrase them, but to bring back that familiarity. While readers who are familiar with more traditional translations may be disappointed to find their favourite passages changed, it does bring new meaning to familiar texts. If a young person is keen to read the Bible but doesn’t know where to start, a good option is to encourage them to try doing the Bible in a year. There are lots of resources out there to offer reading suggestions. I’ve found the Soul Survivor Bible in One Year to be helpful. The readings are written for each day, with a date on if you are organised enough to not miss a day! Extra notes can be found online to help explain the readings, or they can just take the book around with them and know that they can access it easily. HTB Church also have a Bible in One Year app which automatically loads the days readings when you open it, offers the option to listen to the readings rather than read, and has daily commentary from Nicky and Pippa Gumbel. The app is particularly good for both adults and young people who are glued to their phone! 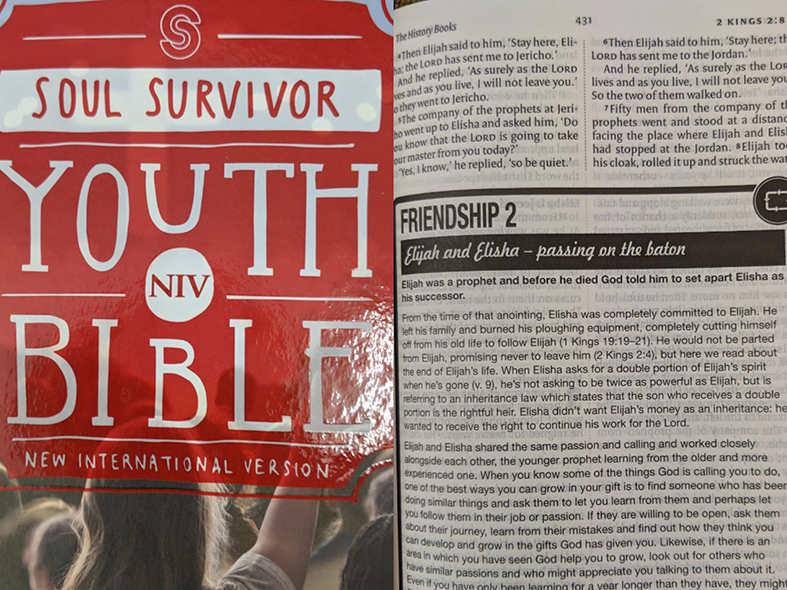 Soul Survivor have also produced a Youth Bible, which uses the NIV translation. Like the youth bibles around when I was a teenager (!) it gives a fact file at the start of each book including the date, author, and overviews of what it’s all about and why we should read it. There are also boxes all the way through offering modern day stories to explain what’s happening in the passage, prayers, young people’s favourite verses, and notes from church leaders past and present about the text. Combined with notes on reading the bible and a handy index of what’s where, it would make a great gift for someone who has recently been confirmed or is wanting to take their next step in faith. 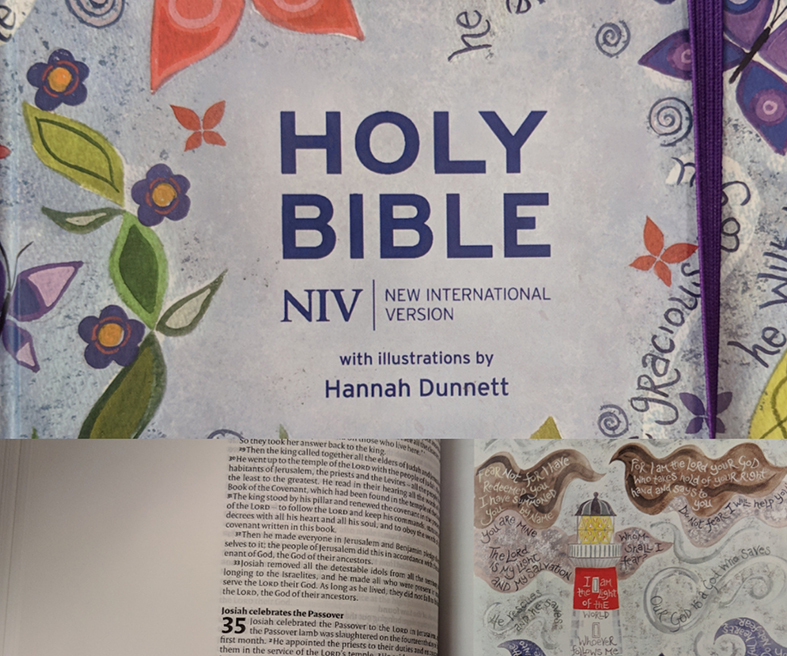 Finally, for people who like the idea of a journaling Bible but would like something a bit more grown up, the Journaling Bible (NIV) with illustrations from Hannah Dunnett is a good option. 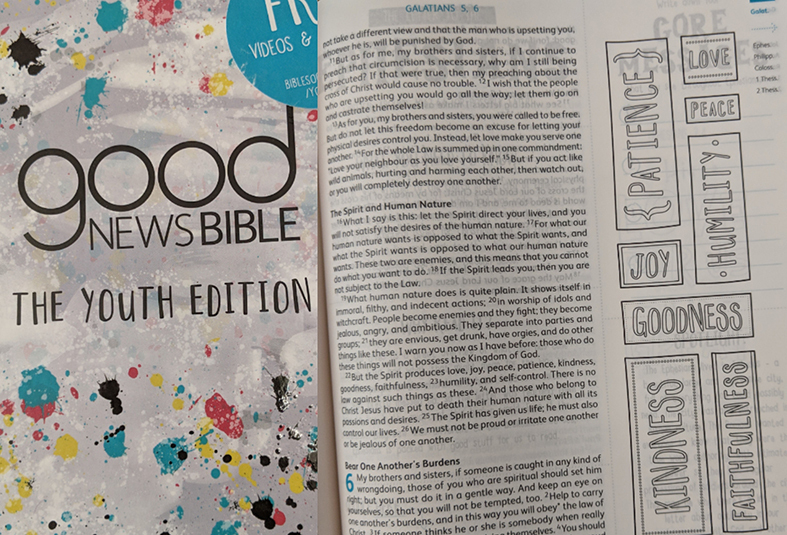 There’s no added extras, except for a good space in each margin to make notes or drawings, and beautiful illustrations from Hannah that bring to life the words of the Bible. It would make a lovely gift for anyone creative, who likes having the space to reflect alongside the passage. I hope this has inspired you to think about the young people in your life, and whether their current bible meets their needs. It might even have made you realise that you would like a new Bible yourself! Just remember that this list is not exhaustive, there are plenty more options out there if we haven’t quite ticked all your boxes. It really is worth thinking outside the box and making sure that the Bible you choose is going to be the one that opens a relationship with God within its pages. This relationship isn’t reserved for adults, but is just as much for children, so their Bibles should do the same for them, whatever stage of life or faith they are at. The Bible will keep growing with them, so make sure that when they’re ready for the next step, you know where to go. If you have any questions feel free to contact any of the youth team, who will be happy to answer them!